* * * Weill's complete Chamber Music, edited by Wolfgang Rathert (Professor of musicology at Ludwig-Maximilians-Universitat, Munich) and Jurgen Selk (Managing Editor, Kurt Weill Edition), makes available musical works by Weill which, while comprising only a small portion of Weill's oeuvre, played a considerable role in his formative years (1919-24). The new edition includes two string quartets as well as two separate movements for string quartet, a sonata for violoncello and piano, the song cycle Frauentanz, and the vocal-instrumental miniature 'Ick sitze daun esse Klops.' The relative obscurity of Weill's chamber music can be partially explained by the overshadowing success of his first stage works, beginning with the acclaimed one-act opera Der Protagonist. However, the compositional quality and musical significance of these works of 'absolute music' have also been obscured by their uneven publication and performance history, which partly explains their absence from the mainstream of the concert repertoire. This is regrettable, as some of these pieces are of considerable ingenuity and aesthetic appeal and may rank among the outstanding German musical works of this period. 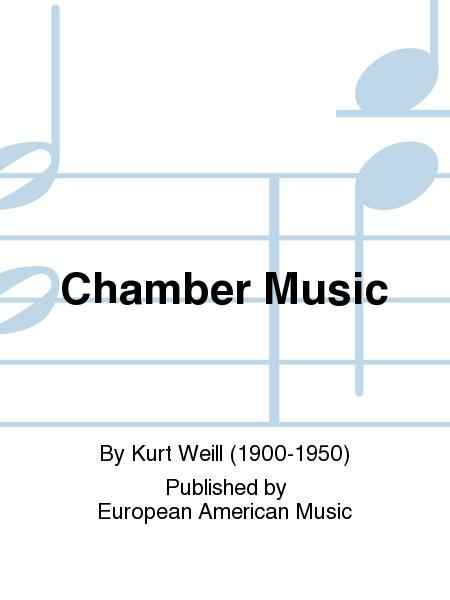 The new edition of Weill's Chamber Music makes this body of work available now in one volume. 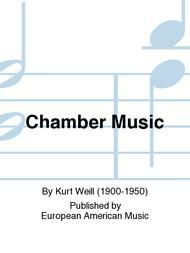 Several of the Chamber Music works included in the new edition have never before been available in print.